Relaxation awaits you at Summer Retreat. 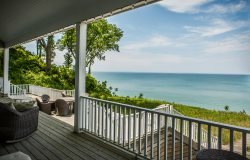 Centrally located in Union Pier, MI close to Lake Michigan beaches and restaurants. This 6 bedroom 2.5 bathroom home poses as the perfect escape for a week retreat or family reunion. As you enter the home you walk into a large dining and living area perfect for gathering with family or friends. Off the living area there is a TV room with a couch a chair and day bed. Living room is complete and cozy with wood burning fireplace. Dining room table seats 10 people with a second table and chair set in the living area. As you walk through to the kitchen complete with electric range and both a drip coffee maker and Keurig maker as well you see another table for six. Sliding doors off the kitchen lead to a sunroom with couch, chairs and another day bed. The homes only half bath is directly off the kitchen. To the back of the kitchen you find yet another sitting room with TV. The first bedroom with a full size bed and a full bathroom are located just off the living room as well. Upstairs offers five of the six bedrooms and one full size bathroom. Both of the full size bathrooms in the home are spacious and offer separate shower and bathtubs. Outside you will find a hot tub, an outdoor shower and several decks perfect for relaxing on a balmy summer day. This home has no shortage of areas to gather with family or friends. Make Summer Retreat your summer destination.